If you don't have health insurance then you should really get it. Most people get health insurance via their employers or through existing government programs like Medicare, Medicaid or VA benefits. But there are still a lot of people who don't have insurance for various reasons. Before the Affordable Care Act (ACA) (everyone calls it Obamacare) there were a lot of people who really had a difficult time affording health insurance. But with the ACA there are now subsidies that help pay for the cost of health insurance for those with medium or lower incomes. If you don't have enough money to afford it then you can get generally get coverage under Medicaid. If you make too much money to qualify for Medicaid then you will probably qualify for a premium subsidy from the government that will help pay the cost of health insurance. If you make too much to qualify for the subsidy then you can afford health insurance. I think this really splits the uninsured into two groups, those who have difficulty affording it but can now get aid through the government programs or people who can actually afford it but don't buy it. Some people feel they can't afford insurance but they simply aren't making it a priority. Health insurance should be a priority over many other expenses. If you make an average income or better than you should have money in your budget to afford health insurance. If you don't feel you have the money then you need to re-prioritize your spending. People without health insurance generally skimp on healthcare when they need it since they can't afford the out of pocket costs without insurance. What good does cable TV or a nicer car do you if you end up seriously ill for lack of adequate health care? Its not likely you'll have a giant unaffordable hospital bill but the consequences are catastrophic. 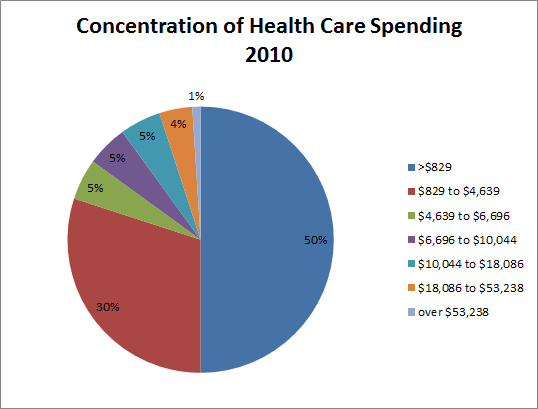 If you do end up with a serious illness or injury then the total healthcare costs can easily bankrupt most people. Some people feel that going without health insurance is an acceptable risk because they think the chances of needing it are low such that they feel its 'worth it' to fore go buying insurance and take the risks. We don't treat auto insurance or home owners insurance this way so I'm not sure why people make such choices with health insurance. Healthcare costs can wipe you out financially just as well as a severe auto accident or a home fire. Younger people may also feel that they have no 'need' for health insurance because their healthcare costs have been generally low. Younger people are generally more healthy and do have relatively low healthcare needs and lower risks. This however is not good reason to go without health insurance entirely. Younger people are not immune from serious illness or injury. While its not likely you'll end up with a giant hospital bill it can and does happen to people who are under 30 years old. Just stop and think about all the people you know and who you know in their 20's who've had serious illnesses and serious injuries. I'm sure you know someone. Healthy lifestyles also don't defend you against all serious healthcare costs. A lot of people seem to think that because they do a good job taking care of themselves with good diet and exercise that this means they're immune to hospital stays. Certainly keeping in good shape will keep you in good health but it doesn't defend against all illnesses and injuries. It may make good sense to get a high deductible plan but you need catastrophic coverage at a minimum. Young and healthy people do have lower healthcare costs so a high deductible plan may be a good idea financially. But you should at least get a plan that will kick in and protect you against extremely high medical costs for serious illness or injury. People under 30 can still buy catastrophic plans under the ACA and the Bronze level often has $5000 level deductibles. These plans are often quite reasonably priced (relatively speaking) especially when you consider subsidies available to most people. Please make health insurance a priority in your budget. Going without health insurance is not worth the risks. If you read all the personal finance sites and blogs like I do you'd get the impression that everyone and anyone has a Roth IRA and that they're a really big deal. Well not so much in reality. A little under 2% of all retirement funds are held in Roth IRAs. I figured that from data in the EBRI issue brief titled IRA Balances and Contributions: An Overview of the EBRI IRA Database. The data in the report is for 2008 so its a little dated, but I'm assuming the mix of moneys in retirement accounts hasn't changed drastically. First I jump forward to Box Figure A in the report that shows that about $13.3 trillion was held in retirement accounts and 26.8% of that or $3.6T is in IRAs or Keoghs. Next look at Figure 1 in the report that breaks down the % of different kinds of IRA accounts people have. Now you might be tempted to think that if IRAs are 26.8% of retirement and 23.4% of IRAs are Roths that would mean that 26.8% x 23.4% of retirement funds are in Roths. But thats not the case because the average balance in a Roth is actually much lower than the average balance in other IRAs. You can see the Roths hold the smallest balances. 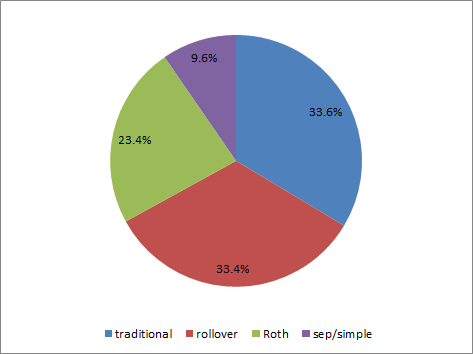 Roths account for just under 6% of the total money in IRAs. 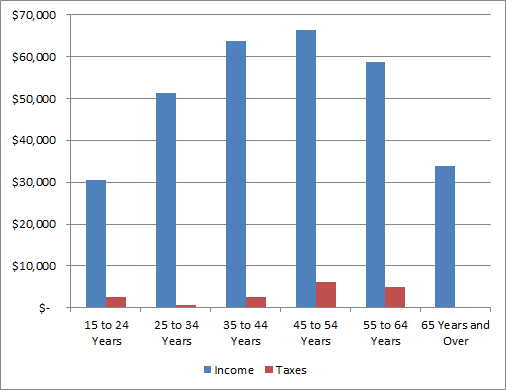 And as IRAs are 26.8% of all retirement funds then that means that Roths hold about 1.6% of all retirement money. Makes me happier that I have a handful of twitter followers and never joined a blogger network. I now realize its because I'm ethical and I just thought I was lazy. Bargaineering asks Are women really paid only 77 cents for each dollar men are paid? PlanetMoney explains U.S. Is The World's Largest Producer Of Natural Gas. Here's What That Means. For $10 a share you can buy ownership in the profit of Arian Foster. You can read the S-1 filing on the investment deal for details. One share will entitle you to your portion of 20% of Fosters earnings. Sounds like fun if you're a Foster fan but it doesn't look like a great investment to me. NFL careers are risky and can be cut short at a moments notice. I wouldn't invest in a single NFL player since its putting all your eggs in a single risky basket financially speaking. Foster is a very talented player so its not like betting on a random average player, but the risk is still pretty high. This kind of investment is apparently allowed by the Jumpstart Our Business Startups Act (JOBS). I'm not sure if this kind of novelty speculation is what they really had in mind. Hopefully this kind of thing will be seen for what it is : a novelty. I don't expect this kind of investment will get much serious consideration or be treated as a serious investment. But who knows. Recently via some second hand gossip I found out that one of my acquaintance has not saved for retirement. That may not sound like big news to you but it was a giant shock to me. The person in question is in her early 50's and married. Until recently they were living in a low cost city and making >$100k annual income. Another person we know quoted her as saying that "it was time she started thinking about retirement". Really? I asked, "started" thinking about retirement? Less than 15 years from retirement age? Yes. Apparently they haven't saved anything for retirement and they now have little money. I had just assumed that they were saving money. They never appeared to live beyond their means and didn't own an expensive house and didn't drive fancy new cars. In general her family is pretty frugal and I think the word 'cheapskate' would apply pretty well to some of them. In fact the word 'miserly' would even be appropriate to one or two of her relatives. (I don't mean that in a bad way.. just saying.) Take someone from a frugal family, give them a relatively high income in a low cost city for a couple decades and it just seemed a given to me that they'd pile up a big sum of cash. Apparently not so. A year or two ago her husband quit his job and they moved their family halfway across the country back to our mutual home town. At that time I remember asking what they would do for work and apparently they didn't have work lined up. They had just quit and moved. I distinctly remember concluding then that they would be fine because I assumed they must have had a big pile of cash saved up. Actually the fact that he quit his job without another job lined up was another reason I assumed they had a big pile of cash. I gave them the benefit of the doubt that they wouldn't voluntarily jump into the unemployment pool during a recession without money in the bank. I suppose they may have had some money in the bank but apparently not enough to count towards any substantial retirement savings. The best I can figure it, they just squandered their money and/or gave away a lot of it. They have little to show for it. The gossip I got also said they did have "thousands" of movies and a ton of toys for the kids. Oh... did I mention they have 6 kids and 4 still live at home? That kind of spending can add up of course, but I don't think they bought extravagant items. They were quite active in their church so I'm guessing they probably tithed 10% or even more. I also believe they were financially supporting his mother. They also eat organic foods apparently and for a family of 6 that could be pretty pricey. I've tried to figure out how they could have spent all their money and where it could have gone. Honestly this is just blind guess work and I really have no idea where their money went. They spent the past 20-35 years or so living about 2000 miles away from me. After taxes they should have had $6000 to $7000 a month. Their home payment had to have been under $1500. That leaves them $4500 to $5500 a month to pay their bills and live on. I suppose they could have spent up to $2000 on food and eating out. Maybe they spent $1000 on bills. If they gave generously to their church and supporting his mother that could have accounted for $2000 more. This could easily account for all their money if they weren't careful to budget and save anything. Throw in 4-6 kids to raise and it is even that much easier to see how they could walk away with nothing. Top it off with a little credit card abuse and the resulting interest payments and it really shouldn't be hard for someone to spend away $100k a year. Its not very hard to squander a healthy paycheck and people do it all the time. I even found that the company they used to work for does offer employer matching on the 401k plan. They may have never contributed to the 401k and lost out on employer matching or they may have cashed out the 401k when they quit and then spent away that money while they were unemployed after moving. This kind of thing is way too common nowadays and unfortunately people end up like this all the time. You should not assume someone is doing well financially and not only people with expensive new cars and McMansions are failing to save. We recently went through the work of cleaning out and fixing up our old house to turn it into a rental. I figured that would be easy enough. Shouldn't take long right? We'll have this place ready and rented in a couple weeks. No problem! We set about getting the place ready. We hired the guy to cut down the trees and decided to hire a service to clean the house. The trees in question were 20-30' high so I could not cut down those trees myself and we had to hire that work out. Hiring a cleaning service was a choice we made because we wanted to get the place ready to rent quickly and honestly neither my wife nor myself wanted to do the work ourselves. The last time we did a rental prep from my wife's old house we did ALL the work ourselves. We found from that experience that things took longer than we thought and doing everything ourselves ended up losing us more in lost rental income than we saved if we'd simply hired people to do a lot of the work. So this time we vowed to not make the same mistake and hire work out in order to get it turned over quickly and making us rental income. Unfortunately our quick and easy plan wasn't as easy as we'd hoped. I am undoubtedly forgetting some minor items I had to do but I think that covers most of it. I did most of that work myself. This is contrary to the idea we had about hiring people to do everything. I got quotes on hauling the stuff and replacing the dishwasher. I'm making estimated guesses on the cost of painting, cleaning backyard and the various other fixes. Altogether I figure I probably saved around $1500 or more by doing that work myself. Not bad at all for the time I put in. I did not keep track of exactly how much time I spent working on the house. I guess it was probably around 20 to 40 hours. In the end it took a month longer than we hoped to rent the place. That means we effectively lost at most a months worth of rent. The rent for a month is $1100. I also had to pay roughly $100 to carry the utility service at the house for that month. Thats the minimal charges for electric, water, sewer and garbage. That extra month also cost me $50 more to have the lawn guy mow the lawn while it was vacant. Saving that $1500 doing the work myself took me a month and that lost month cost me $1250. So if you figure in that lost month then the net savings of doing all the work myself is about $250. Taxes also differ either way. Doing it myself I've got write offs of about $100 for the utilities and around $300 for materials or $400 total. If I'd paid someone else I'd be in for $1650 out of pocket expenses for the work but I'd be up $1100 in rent so I'd have a $550 deduction. Thats about $150 more in deduction of which would save me approximately $50 in taxes between state and fed. Bottom line after taxes I saved $200. Based on a net savings of $200 that is not a great return at all. 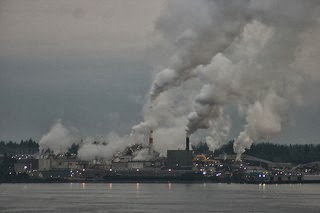 I made in the vicinity of $5-$10 per hour after taxes for my time. Now that makes it sound pretty bad. That does assume that I would have been able to get all the work done and completed within a two week period. In fact I don't think we even got the tree cut down and cleared out in that time. The guy we use for tree work is not fast but he is good and and he's cheap. Other quotes we've had are around double what he charged. So going with the cheaper tree guy saved us about $1000 which is certainly worth doing as worst case we lost $1100 rent from his slower work. I'm also making estimates on how much the painting and misc. work would cost and usually my estimates on such things are half of what the costs end up being. So its quite possible that I would have taken 2-4 weeks to do the work even if hiring people and I might have paid $2000-$2500 to do that work. Worst case if I'd hired everything it might have taken just as long and could have cost me $3000 more than I spent. Its hard to know what would have happened exactly, and I can really only guess. I can say that I didn't do a very good job of planning the work out and I'm sure I could have gotten everything done faster if I'd planned it better and hired more work done. Given the demand we had for the property when we did rent it, I'm sure we could have made some more rent if we'd gotten it ready faster. But ideally if I'd planned everything and just hired reasonably priced contractors then I could have saved a lot of my own labor and only spent a few hundred dollar more net. 1. Be more willing to have work done even if its work I know I can easily do myself. This is a lesson I need to beat into myself since my first inclination is always to do everything myself. I told myself after the last big project for my wife's house that I would pay for more work this time but then I lapsed into doing half of the work myself. 2. Start with a complete and accurate assessment of all the work that needs to get done. One of the bigger problems I ran into this project was due to poor planning. I started out with the perception that I really only had a couple main things to do : cut down two trees and clean the interior. I hired people to do those items. But then the project grew and grew and I realized all the other various things that needed to be done. How Many Students Get Athletic College Scholarships? Thats the answer. 2% of college students get an athletic scholarship. I got that answer off the NCAA site. By comparison when I looked at merit scholarships last year in my article How Many College Students Get Scholarships? I found that 8.3% of students got private scholarships and 8.8% got institutional scholarships. I assume there is some overlap though and there is nothing I know that keeps a student from getting private scholarships and athletic scholarships. All and all though, I'd say its about 4 times as likely that an individual will get a merit based academic scholarship than an athletic scholarship. However I'd assume athletic scholarships have a higher average value. A little while ago I watched a documentary on cable called American Teacher . The documentary was about teaching in American and was generally pro-teacher. But the point that I found interesting was a chart they showed in the middle of the film that compared teacher wages to other professions. 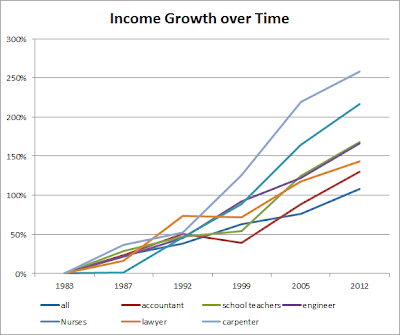 They claimed that real estate brokers and lawyers had significantly higher income growth over the period than teachers. The numbers seemed a bit off to me. 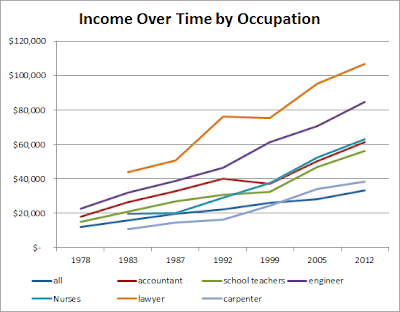 I thought that wage trends over time for different occupations would be an interesting topic to explore. 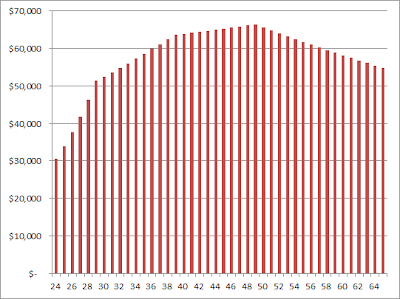 I know the general income for my occupation where I live has gone up abut 50% in the past 15 years. On the other hand my fathers occupation has been virtually flat for the past 15 years in his home city (though he's now retired). 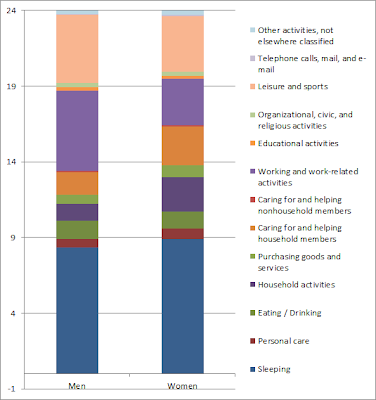 I set out to find income figures per specific occupations over several decade period. It was pretty hard to find good consistent data breaking down income by occupations. I looked all over the Census site to find a good list but it seemed the data they collect changes a bit over time. I was at least able to find a hodge podge of tables that give me numbers for some common occupations. I couldn't find consistent data and some of its not really comparing equal information. 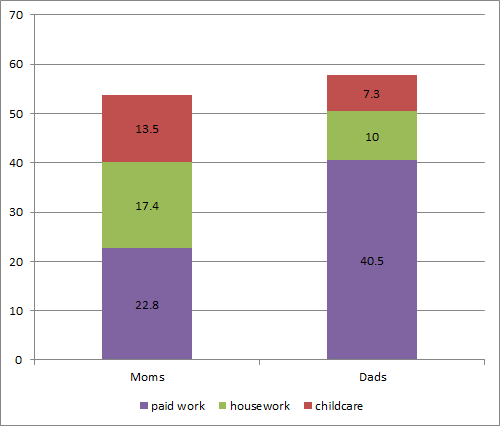 But I think its close enough to get an OK idea of wages for the occupations in question. 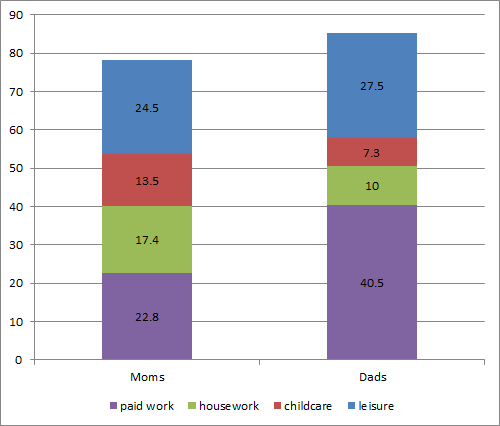 Data for 1978, 1983, 1987 and 1992 are from the Census Consumer Income reports. Annoyingly they seem to only give income for males or females but not the combined population so I'm using the numbers for males. The 1999 data is from the Census page. 2005 is from BLS OES and 2012 is the current BLS OES. For BLS data I and used hourly wage x 2000 wages as an estimate of annual median wages. For the first few data points the figure for 'lawyer' is actually including judges but the later years is lawyers only, so that means that the income figures for the lawyer category are actually measuring different set of people. For engineers I first had a general category for all engineers but then they split them up so I picked just electrical engineers which seem to be closer to the middle of income for engineer specialties. The teacher incomes are annual averages in the later years because they didn't have median hourly rates. Teachers are almost all paid salary and theres little variation in wages. 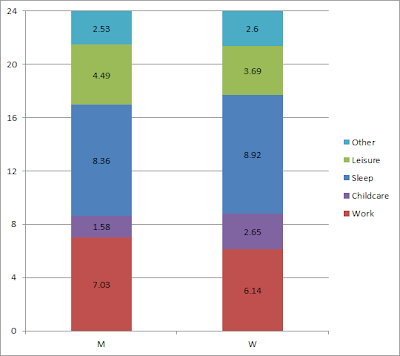 So let me be clear, the charts and data are pretty flawed due to my mix matched data sources with inconsistent numbers. Almost makes this exercise futile. I only had a few data points from 1978 so I didn't include that year in this chart. It just so happened that the occupations I sampled all grew faster than wages in general. I suspect thats because many many low skill service jobs make up a larger portion of the employment and those wages haven't grown as fast compared to the jobs I sampled which are mostly skilled professional occupations. Carpenter, Nurses and teachers grew the fastest. 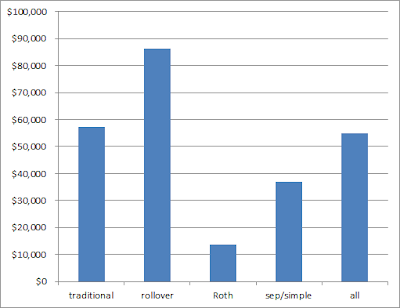 However part of that may be a fault in my methodology of pulling together miss matched sources. Both occupations had high jumps from 1999 to 2005 and thats when I went from a census table to the BLS figures. Median hourly wages x 2000 may not be very accurate approximation for median annual income for some occupations versus others. For example carpenters tend to have higher unemployment during economic downturns and may have seasonal unemployment due to weather. School teacher wages jumped 50% in my chart from 1999 to 2005 and I'm pretty sure thats not right and must be the difference in what I'm reporting from the different sources. Lawyers didn't grow as fast as other professions but I started out with data for lawyers and judges and then ended up with only lawyers and I'm sure judges pulled up the initial numbers so makes it look like they haven't grown as fast. Again, I have to point out that the numbers are not very great. If I can find better data I'll revisit the topic. 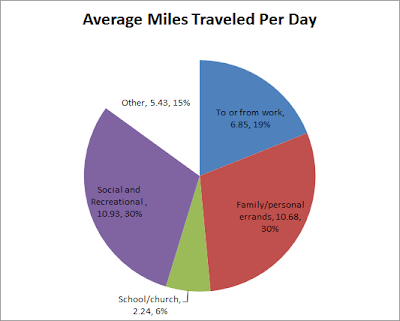 For now we've got a set of data with some flaws.